Adding artwork is a great way to add a fun touch of your own personality to your space. If you are doing what everyone else does, stop ….why not make it yours? Create a unique focal point or tell a story with your own work. 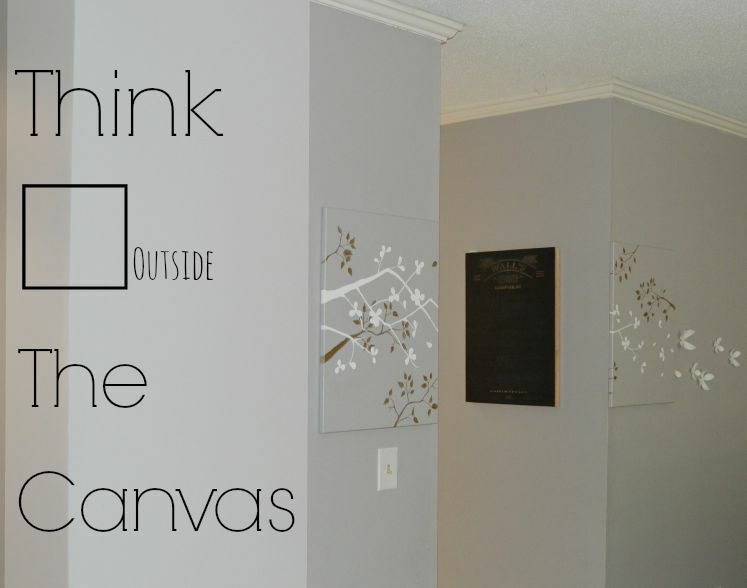 Here is one way I created a piece of artwork to tie together an open space. 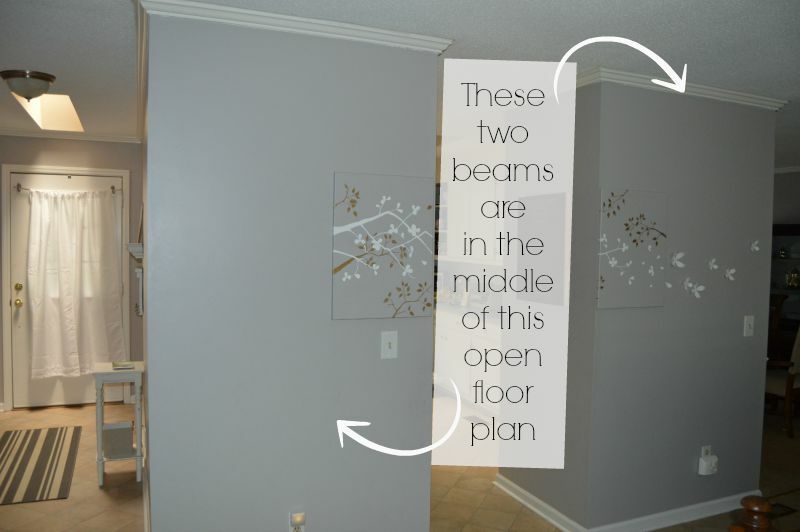 An open floor plan can be tricky to get right. You don’t want to overcrowd the walls with too much clutter or the entire space won’t flow well. To keep it light I matched the canvas with the color of the wall. I kept the color and design simple. I took these two separate beams and tried to make them appear as one split up wall. The tree extends from one side to the next, then similar flower shapes extend outside of the canvas. I placed them on the sides near the opening of the door way to center the wall as a whole. Also, I don’t like when things look the way they are “supposed to”. Also, no, the curtain rod on my door is not hanging bent on purpose….that’s a project for another day. The first thing I did was to take two same size canvas boards. I painted them with a coat of the same grey semi-gloss interior paint that is currently on the walls. Not only dos this match the wall perfectly, it is wipe-able. Next I painted the gold tree portion. Since dark colors recede the dark gold will add depth to the background. NOTE: This can be done with any colors, you can find a color close to your wall and colors to match your room. I chose gold because it matches my decor in the surrounding area. If you look close you can see that these are just simple shapes, the leaves don’t have to be complicated. As long as you keep the nature of the tree as it naturally would be the shapes don’t have to be perfect. You can always paint over a mistake. I used a metallic acrylic paint for the tree branches. Paint them close together so you can decide where they disconnect from one painting canvas to the other. If you are not sure how to make the branches, google tree images to get a feel for general characteristics. Remember, if you use interior semi-gloss paint it wipes easily. Keep a wet cloth near by for any mistakes or errors. Once dried, I added the white branches. For added depth I made the branch white to stand out. I also made it a little larger and the branch thicker to appear closer. 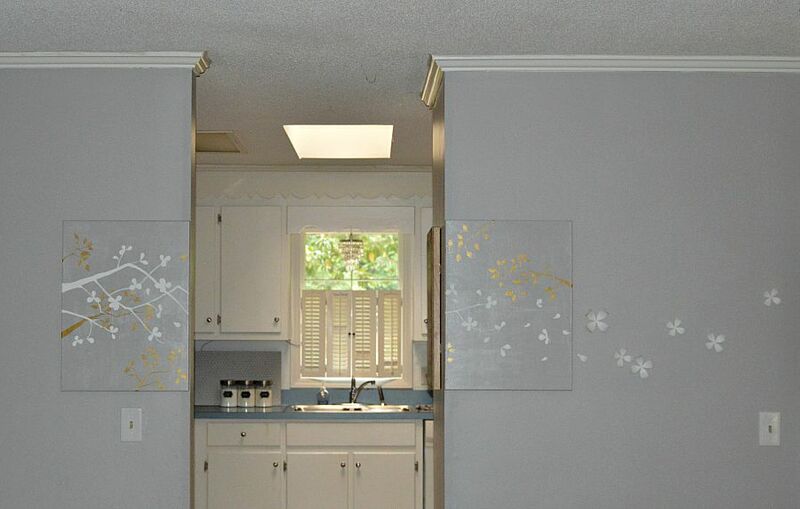 I wanted the tree leaves to appear to flow outside the canvas and onto the wall, as if there were a breeze. 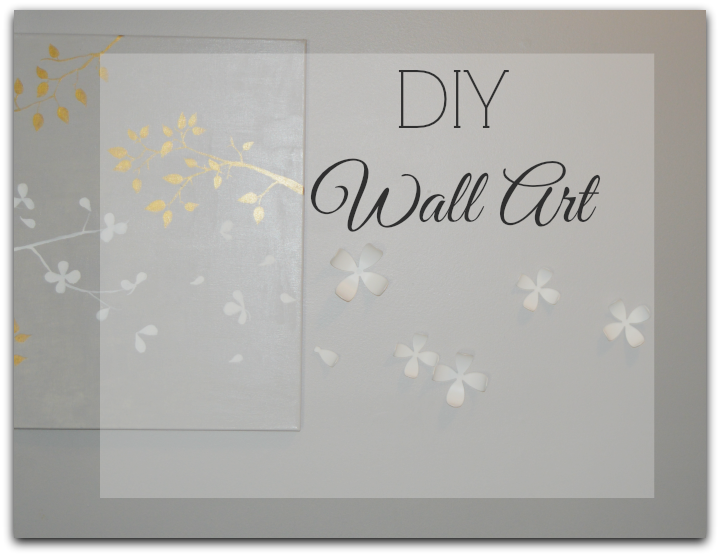 I found some simple flower wall decals that are hooked to the wall with tacks. 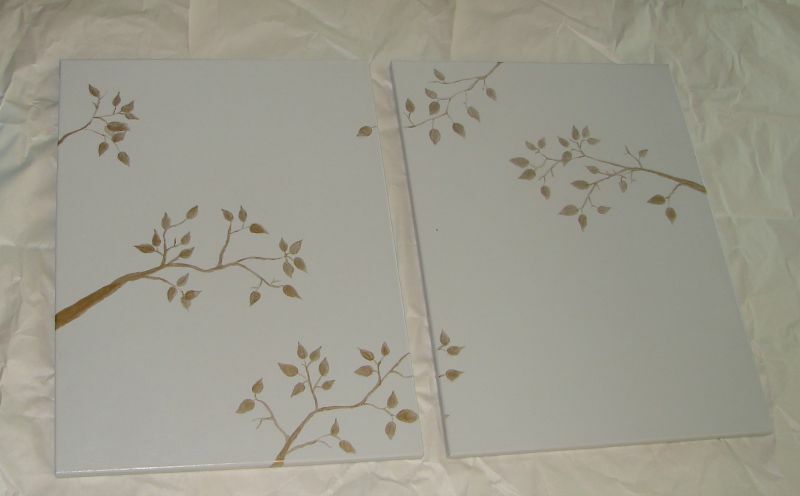 I used the shape of the flower decal to help me decide which shape to give the white flowers in the painting. Once I hung the canvas, I marked with a pencil the areas I wanted the decals to go. In this pack the tacks are all universal in size, once you place the tack you can switch out the different size flowers. This is a playful and fun way to decorate your space that sparks instant conversation when guests walk in.